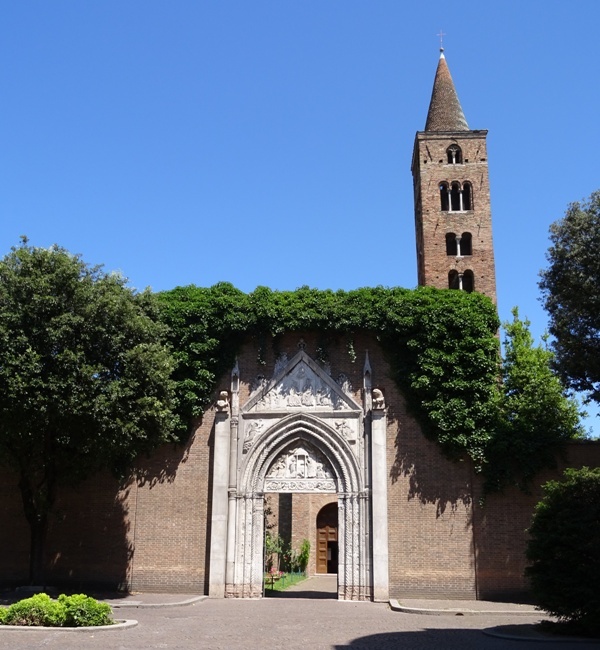 The San Giovanni Evangelista is perhaps the oldest church in Ravenna that is still standing. It is possible that the Santa Croce in the same city is marginally older, but we cannot know for certain. 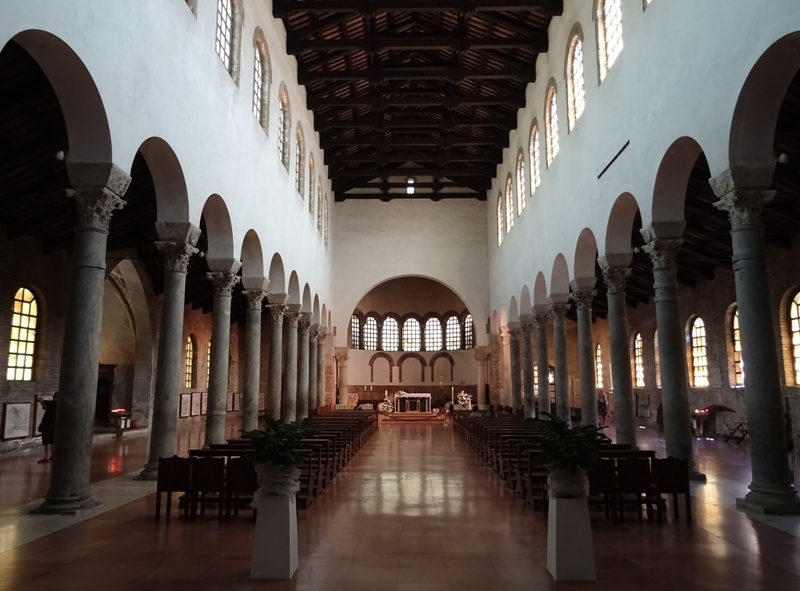 In any case, the Santa Croce is now closed to the public, so there is a good reason to start this series of posts about Ravenna with a church that we can actually visit, and that I did visit in June 2016: the church dedicated to Saint John the Evangelist and commissioned by Galla Placidia, half-sister of the Western Roman emperor Honorius (395-423) and mother of his successor, Valentinianus III (425-455). Galla Placidia was a remarkable woman. She was born between 388 and 393 as the daughter of the Roman emperor Theodosius I and his second wife Galla. Theodosius already had two sons from his previous marriage, Arcadius and Honorius. At the time of his death in 395, the Roman Empire – which had already been split before by Diocletianus, but had been united again by Constantine the Great – was split again, and this time for good. Arcadius ruled the eastern half, which was both the most populous and most prosperous part of the troubled Empire. The younger Honorius ruled the western half and was soon faced with incursions by Visigothic tribes. Initially these tribes were chased off by Honorius’ capable general Stilicho, but the situation changed dramatically when Honorius had his general killed in 408. Two years later, the Goths sacked Rome, an event which shocked the Ancient World, even though the actual damage to the city may have been modest (see Rome: Santa Pudenziana). Galla Placidia was carried off to Gaul as a valuable hostage. In 414, as part of a deal between Honorius and the Visigoths, she was married to the Visigothic king Athaulf. A son named Theodosius was born, but died soon after. Athaulf would be assassinated in 415 or 416. Galla returned to the imperial court of her half-brother and was married to the Roman general Constantius in 417. Constantius and Galla were named augustus and augusta in 421, and thus she is often named ’empress’ in modern sources, although it is necessary to point out that these titles were initially not recognised by Arcadius’ son Theodosius II, who by this time ruled over the Eastern Roman Empire. Another important point is that by this time, the imperial Roman court was neither in Rome, the traditional capital of the Empire, nor in Milan, where it had been since 286. In 402, Honorius had moved the court to Ravenna. Many reasons have been given to explain this move. Ravenna was considered to be more defensible because it was surrounded by swamps and commanded a favourable position on the shores of the Adriatic Sea, which meant that it provided excellent connections with Constantinople. Ravenna in those days was by no means a large city. It had functioned as one of the Empire’s most important naval bases since the days of Augustus, but had been in decline since the Crisis of the Third Century. The city may have had between 5.000 and 10.000 inhabitants (Mauskopf Deliyannis 2010). Although it is impossible to read Honorius’ mind (and do so posthumously, after more than 1.600 years), another consideration may have been that small and rather empty Ravenna was seen as the perfect tabula rasa to create a new, distinctly Christian capital in the West, just like Constantine the Great had done with Byzantium in the East. In other words, the ugly duckling could be turned into a beautiful swan. 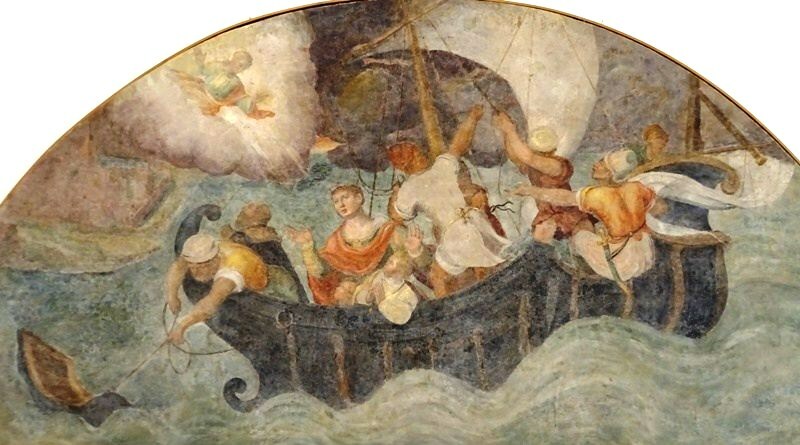 Fresco of Galla Placidia’s near-shipwreck (Museo Nazionale di Ravenna). A Christian capital of course needed churches. Honorius himself built a church dedicated to San Lorenzo (demolished in 1553), but at least two churches are attributed to Galla, the San Giovanni and the aforementioned Santa Croce. When Honorius died without an heir in August 423, the usurper Johannes seized power, until Theodosius II decided to intervene from Constantinople and nominated Galla’s son Valentinianus (born 419) as Honorius’ legitimate successor. Johannes was ultimately defeated, and in the aftermath figures like Flavius Aetius and the Huns entered the scene, but these events need not bother us now. What is important here is that Galla’s son was only six years old and that Galla herself acted as a regent until 437, and did so very capably. Galla returned to Ravenna in 425, perhaps to oversee the installation of her son as augustus. The sea was very rough, and her ship – carrying her son and her daughter Honoria – was caught in a violent storm. Galla Placidia then prayed to Saint John the Evangelist and vowed to build a church dedicated to him if the ship and its passengers survived. The ship was indeed spared, and Galla Placidia fulfilled her vow, perhaps as early as 425. The San Giovanni after the 1944 bombardment. The San Giovanni Evangelista was built using spolia, i.e. materials used previously in older buildings. In this case bricks were used for the walls and columns dating back to the first to fourth century to create a nave and two aisles. The church used to have a narthex, which was incorporated into the church itself at an unknown date, but certainly after the ninth century, as the narthex is still mentioned in a ninth century source. The campanile was added in the tenth century. Professor of Late Antique and Byzantine Studies Judith Herrin claims that Galla Placidia’s church must have been a spectacular monument, which could compete with the city’s cathedral. And yet almost all of that splendour is gone today. Galla commissioned wonderful mosaics for her church, but whatever was left of these works of art was destroyed when the Allies accidentally bombed the San Giovanni in 1944. The church is located just 200 metres from Ravenna’s railway station, which was the Allies’ target. 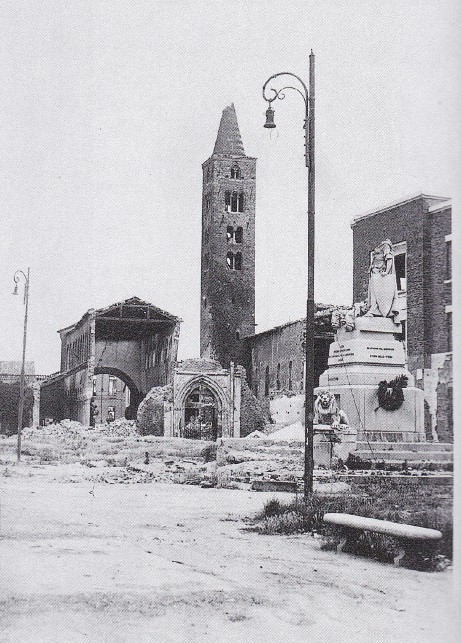 Pictures taken after the bombardment show that the damage to the San Giovanni was severe and much of the church had to be rebuilt once the War was over. Fortunately, there is still a thing or two to see today. The church premises are entered through a fourteenth century Gothic gate. The lunette possibly shows Saint John the Evangelist appearing to Galla Placidia, who prostrates herself before him. 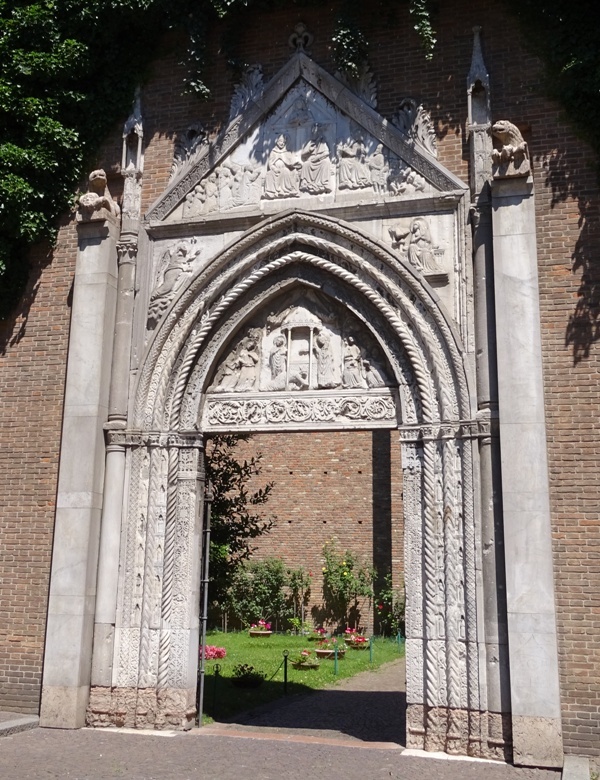 A little higher, on both sides of the arch, one sees the familiar theme of the annunciation, while the gate is topped by a tympanum showing Saint John again, this time with a king or emperor – most likely Valentinianus III – seated next to him. Above them is Christ the Saviour, and to the right of Valentinianus we see Galla Placidia again. Judging by the picture taken after the 1944 bombardment, the top of this ornate gate was blown off, so obviously it had to be restored an cannot be completely original. The picture also shows that the facade of the church was gone after the bombardment, so this had to be rebuilt as well. The columns and Corinthian capitals we see today are original though, as are the so-called ‘impost blocks’ – the Italian word is pulvino – between the capitals and the arches. The church has an open roof and the walls, apse, triumphal arch and the area above this arch are completely devoid of decoration. It is hard to imagine that this was once indeed a spectacular monument, as professor Herrin claims. The soberness of the church has a certain charm, but it is definitely a pity that none of Galla Placidia’s mosaics have survived. However, we do have a few descriptions of the mosaics. They are, for instance, mentioned in Girolamo Rossi’s Historiarum Ravennatum, which was first published in 1572. Rossi (1539-1607) was an historian who obviously saw the original mosaics with his own eyes, although it is hard to conclude anything about the state they were in in his days. The San Giovanni currently has two reconstructions of the mosaics on display. The most noticeable difference between the two versions is the location of the windows. The current church has an apse, rebuilt after World War II, with seven windows. Three more windows, now filled in, can be seen below these seven. It is difficult to say what the original arrangement was. Apparently there are no photos of the church from before the bombardment, and of course changes may have been made to the windows at any time between 425 and 1944. However this may be, of the artists who drew or painted the two reconstructions, the first chose to include the three window arrangement, while the second reconstruction has a picture of an apse with seven windows, like today’s church. Area above the triumphal arch: in the centre is Christ, giving a scroll to John the Evangelist. The scroll is presumably the Book of Revelation, which is often attributed – correctly or incorrectly – to Saint John. To the left and right are images of Galla Placidia on her ship with her children. On the triumphal arch itself are the faces of ten Roman emperors. The conch of the apse has a large image of a seated Christ holding a book. The text on the book pages is from the Gospel according to Matthew. The Latin text in one of the reconstructions is actually “Beati misericordes cvoniam miserebitur Deus” (“Blessed are the merciful, for God will show them mercy”), and if this is indeed the original text, the mosaicists used a pre-Vulgate version of the Gospel. In these reconstructions, Christ is flanked by book cabinets containing the four Gospels. To the left and the right of the windows we see the four Evangelists and/or their symbols. Finally, below the windows, there is a scene in which Peter Chrysologus is the most important protagonist. He was Bishop of Ravenna from 433 until his death in 450 and was closely connected to the imperial court in the city. His nickname ‘golden-word’, reportedly given to him by Galla Placidia herself, refers to his oratory skills. In the scene, the bishop is celebrating mass in the presence of two assistants and an angel. The Eastern Roman emperor Theodosius II is portrayed on the right, with his wife Eudocia and soldiers, while Theodosius’ father and predecessor Arcadius is shown on the left, also with his wife, Aelia Eudoxia, and soldiers. It certainly is a pity that the mosaics were lost entirely, but at least the two reconstructions give a good impression of their former grandeur. I can only conclude that professor Herrin was spot on with her comment. The most interesting decorations that remain inside the church are fragments of the mosaic floor that was installed in 1213. The fragments are placed along the walls of the aisles and depict – among other things – animals and fantasy creatures (unicorns and mermaids if I am not mistaken). Some of the mosaics are about a more serious theme: the Fourth Crusade and the conquest of Constantinople by the crusaders and Venetians in 1204. 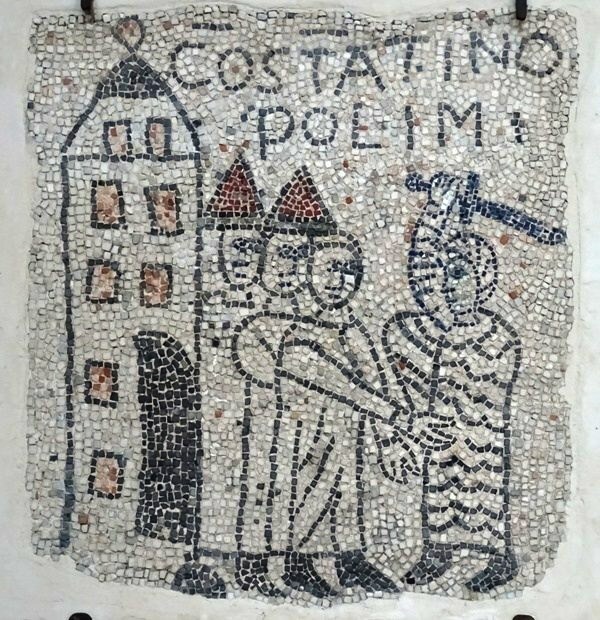 One of the fragments has the text COSTATINOPOLIM and is apparently about the moment the crusaders entered the city and began to sack it. 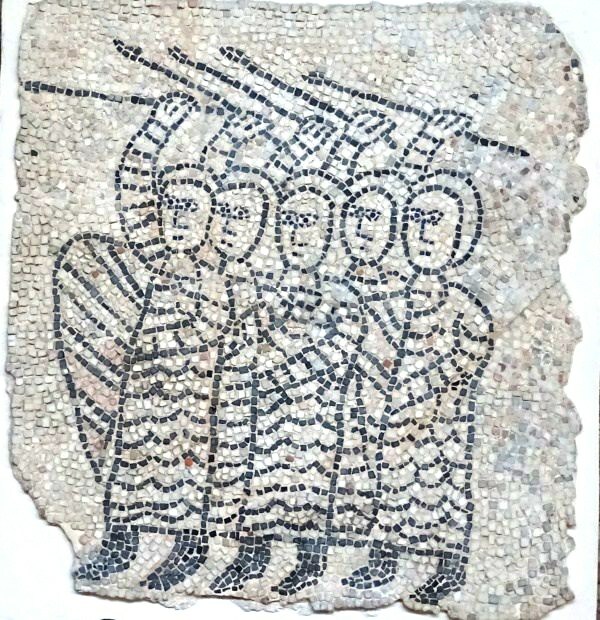 Another fragment shows a contingent of soldiers clad in mail and armed with spears. Ravenna’s official tourist website calls the mosaic floor ‘gorgeous’, but that is an exaggeration. The mosaics are certainly interesting, but not nearly as beautiful as the Late Antique mosaics that can be found in other Ravennate churches. In fact, they are rather simplistic, the people depicted in the various scenes are not very realistic, the perspective is clumsy and the colours are a bit mat. 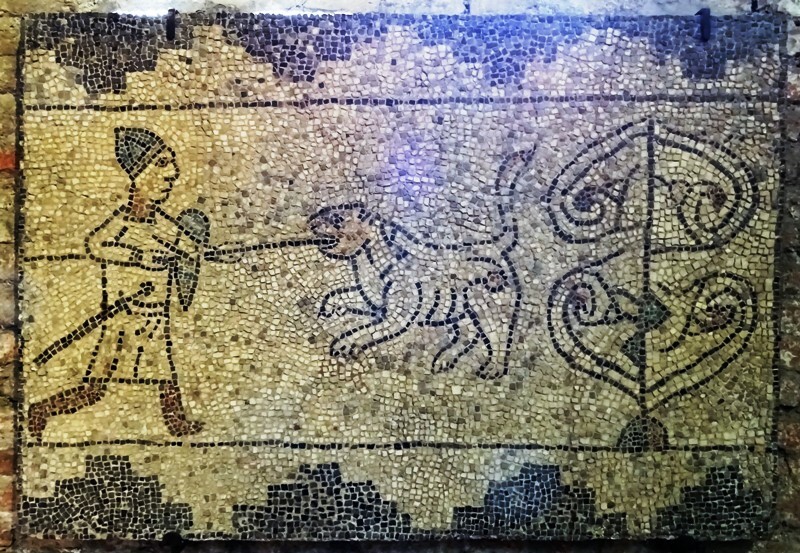 Most of the mosaics can be seen in this YouTube movie about the San Giovanni. It all depends on whether John the Evangelist, John ‘the disciple whom Jesus loved’ and John of Patmos are one and the same person. They were certainly believed to be so by many in Late Antiquity. Matthew 5:7 in the Vulgate is: “Beati misericordes quia ipsi misericordiam consequentur”.